Recently, Amazon’s ambitions to build a vast private label empire have become unmistakably clear. Clue #1: Amazon has been known to award the Buy Box and promotional banners to its own products. 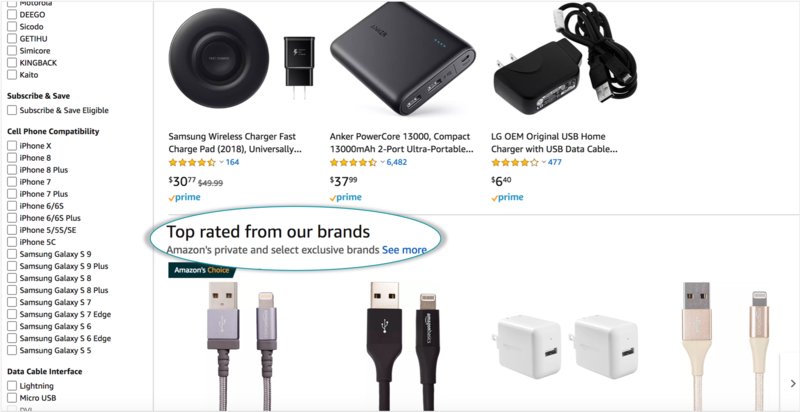 While Amazon has significantly scaled back on these placements amid scrutiny for being unfair, it continues to reserve special promotional spots for its private label products. Clue #2: Amazon has a portfolio of over 500 brands exclusively available on Amazon.com. Its private label business is already expected to generate over $25 billion in revenue within the next three years. Clue #3: Amazon has launched a series of programs aimed at growing its brand network and thereby increasing its profit margins, giving them more control of the supply chain and boosting customer retention rates, among other benefits. Keep reading to learn what each program entails and what they could mean for your brand. Created in 2015, the Amazon Exclusives store features brands that you can only find on Amazon outside of the brand’s own website and brick-and-mortar stores. The store spans a growing number of product categories, including tech, home, fashion, beauty, baby and toys. The stated objective of the program is to help buyers “discover unique and innovative products from emerging brands.” Behind the scenes, it’s also a way for Amazon to connect with and sponsor inventors or early-stage startups before their sales take off. Amazon onsite marketing, email campaigns, giveaways, etc. Free Lightning Deals, video/HTML on listings, etc. We’ve seen the Amazon Brand Incubator be referred to as “the reincarnation of Amazon Exclusives” because it includes Exclusives. In other words, to get featured in the Exclusives store, you must first apply and be accepted into the ABI program. The main difference between the two is that ABI doesn't require exclusivity. While you won’t get the same brand protection or full marketing services as Amazon Exclusives brands, ABI still promises increased product discoverability, promotional levers and other perks. Participation in ABI requires a six-month commitment, an additional five percent commission to your current product category commission rate and sole use of FBA. Success Story: Bargain sunglasses brand Privé Revaux became an international brand in just one year with the support of ABI and Amazon Exclusives. It’s sold in 70 different countries and thrives from celebrity endorsements, Amazon-backed marketing and Amazon operational support. Our Brands is a close cousin of ABI that's tailored to more established manufacturers and brands. 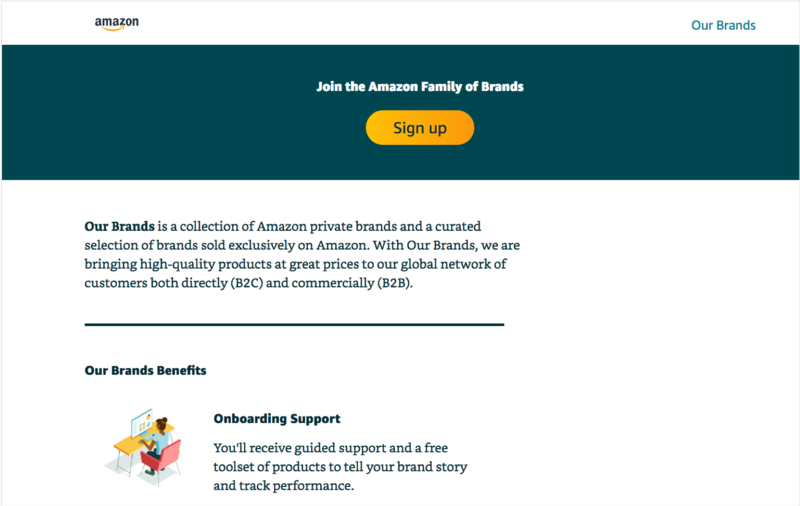 The goal is to surface the strongest of the Amazon Private Label and Amazon Exclusives portfolios to both B2C and B2B audiences. Products enlisted in Our Brands gain preference in advertisements and rankings throughout the site (though the extent is yet-to-be-seen after Amazon's recent removal of controversial placements), in addition to back-office support. The Amazon Accelerator initiative fuels the partnerships that develop these exclusive products. There are reportedly two different programs that fall into this category: Brand Accelerator Program and Manufacturer Accelerator Program. Both enable teams to work with Amazon to create, trademark and own their products—while giving Amazon a call option to buy their brands later in the future. Pro Tip: There are a few ways to tell whether an Our Brands product is fully owned by Amazon or simply exclusive to them. Private label brands will feature either “Prime” or “Amazon” in their brand names (like “AmazonBasics”) or include disclosures within their product titles or brand names. Amazon-exclusive brands, on the other hand, are listed with an “Our Brands” tagline. This invitation-only program targets early-stage startups that seek marketing, shipping, inventory and other retail logistical support in exchange for exclusivity and long-term commitment to Amazon. In 2019, Amazon is looking to onboard about 10 brands into this program, according to Digiday. Each participating brand must generate at least $1 million in sales in their first month on Amazon, maintain a healthy inventory level, have expertise in digital marketing and brand building—and commit at least 5 percent of all revenue from Amazon into Amazon’s Paid Ads program. Cutting out the middleman is certainly part of Amazon’s larger playbook. Hence why through this program, the retailer is courting manufacturers that typically do not own their own brands. Participating manufacturers take care of production and sell items exclusively on Amazon, while Amazon takes care of the marketing and promotion around it. While little is known about the Manufacturer Accelerator Program, we see companies like Arminak & Associates, a packing solution manufacturer and supplier, now launching their own brands exclusive to Amazon. Amazon is building what may already be the largest portfolio of private label and exclusive brands. Instead of going at it alone, the company is leveraging a range of third-party manufacturing and brand-building partners. As Amazon exercises tight control over its digital shelf space (with the added ability to dictate which brands are put in front of its shoppers), large brand owners need to consider the appropriate strategy. CPG companies like Procter & Gamble should feel especially threatened and may want to consider playing ball and creating exclusive brands for Amazon. While it’s unclear how the unit economics compare between traditional non-exclusive wholesale selling and an exclusive brand relationship with Amazon, one thing is for sure: Amazon will continue to evolve its retail business at a blistering pace, and your brand will have to be nimble enough to navigate these changes. If you’re a smaller brand on the 3P marketplace side, you are in an equally precarious position. It’s more important than ever to implement a diversified channel strategy to actively reduce your reliance on any one sales channel. You never want to be in a position in which Amazon can stamp out your whole business, simply by burying your products under its own brands or pulling the plug on your account (it happens, as we saw with the whole Vendor Central fiasco). Much is still yet to be seen with Amazon's private label ambitions. But if anything's certain, it's that the company has an upper-hand and huge incentives to continue down this path, and you never want to be at their mercy if you're looking to grow your success.